The complete name of this cereal is Cranberry Vanilla Grape-Nuts Trail Mix Crunch. It's a mix of traditional Grape-Nuts nuggets, granola clusters, puffed barley, dried cranberries and natural vanilla. The first bites of this cereal are very crunchy and the cereal retains some semblance of crunch for at least 7 minutes in milk. The crunchiness is unique as small crunchy bits are countered by the softness of the cranberries. The puffed barley in the cereal reminded me of Golden Crisp cereal (formerly Super Sugar Crisp). The granola clusters are noticeable in the texture, but their flavor gets overshadowed by the other flavors. Vanilla is noticeable and ever-present. Thankfully, the cranberries aren't too tart. They'd be best described as sweet with a tinge of tartness. All in all, the flavors and textures blend together wonderfully. Each spoonful is slightly different based on how many cranberries or granola clusters you get. This cereal is satisfying and filling. I recommend you give it a try. One word of warning: The cereal box touts that each serving has 9 grams of protein. That's an impressive number. However, each serving also has 12 grams of sugar. That's more than is found in a serving of Kellogg's Frosted Flakes or General Mills' Trix. 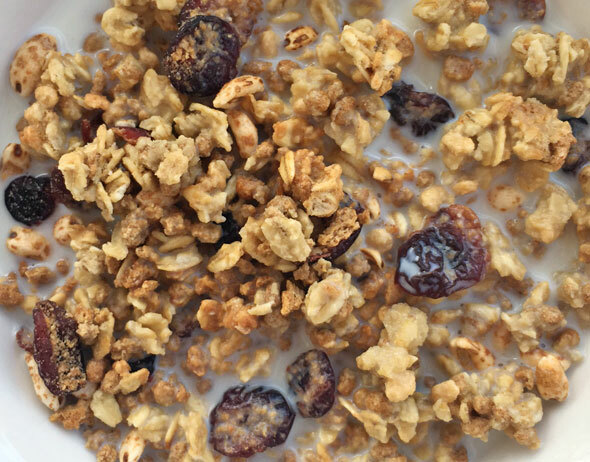 Nutritional Considerations: Each 1/2 cup serving of Cranberry Vanilla Grape-Nuts Trail Mix Crunch has 220 calories, 4 grams total fat (0.5 saturated and 0 trans), 0 mg cholesterol, 140 mg sodium, 40 grams total carbs, 4 grams dietary fiber, 12 grams sugar and 9 grams protein. 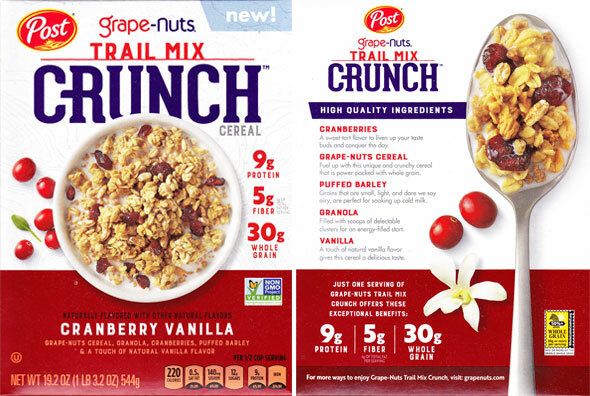 While the box (as of January 2018) indicates that cereal is "new", it should be noted that Post originally produced a cereal with the exact same name back in 2009. To my memory, the flavor and feel is very much the same. The $0.00 price below indicates that a box of this product was sent to us by the company. 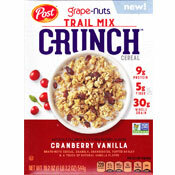 What do you think of Cranberry Vanilla Trail Mix Crunch? 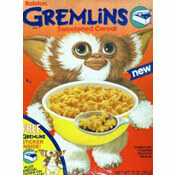 This is a really good cereal. Walmart had it for a short time, and then dropped it for no apparent reason. Very hard to find a retailer that carries it. I love it. I hope it stays.